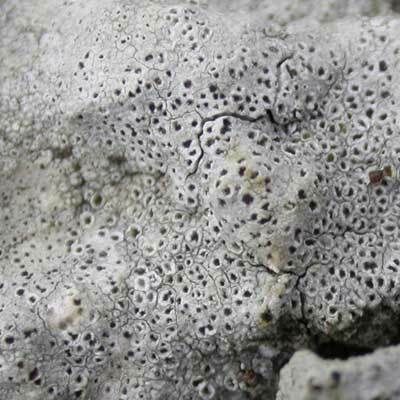 This crustose species of sheltered, siliceous rocks and walls is distinctive among the rock-inhabiting lichens in its crater-like, cup-shaped discs and red reaction with fresh bleach (C). 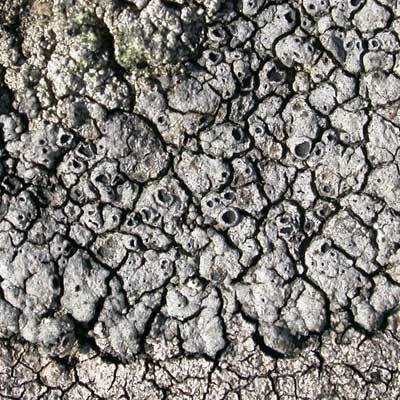 The grey, cracked, warted, rough-surfaced thallus is scattered with numerous discs in various stages of development which emerge from deep in the crust. When fully mature they can look like moon craters filled with ice and sprinkled with crushed snow. 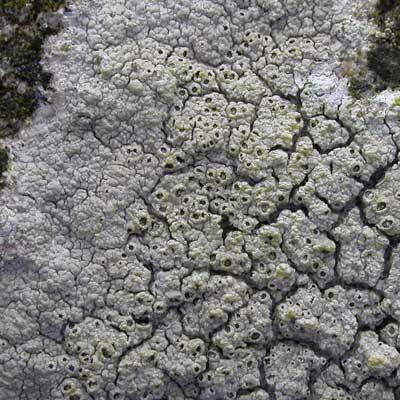 Old areas of thallus can have discs cranky and contorted with age. Frequent in the north; rare in south and west Ireland. On sheltered acid rocks and underhangs, and around the gaps in dry stone walls. Simms, M. J., (2016). Diploschistes scruposus (Schreb.) Norman. [In] LichenIreland.